The evolution of mobile technologies has become a recurring cycle of replacing older generation networks with more advanced ones. And it’s happening fast. With billions of people now reliant on daily network access, it is creating a higher demand for better and more reliable networks. This is leading service providers like Verizon and AT&T to invest billions of dollars into creating the most efficient networks for consumers and businesses to depend on. Unfortunately, providers only have so much real estate on what their towers can support and that is what causes older networks to sunset, and become ousted by new networks with more advanced features. This race for better and faster ensures that our smartphones and devices are ever-faster and more reliable. This affects not just smartphones but our networked devices as well. 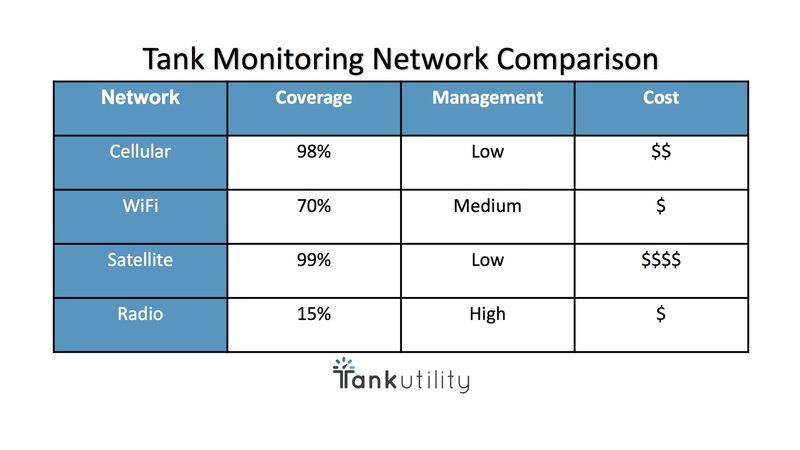 Devices such as tank monitors are greatly affected by network coverage and reliability. That makes it essential to include choice of networks as a critical buying criteria when purchasing these solutions. An ideal network should support high levels of connectivity and reliable transfer of tank level data to enable more efficient delivery scheduling to propane and fuel oil tanks. In other words, a network that will help you save and earn more money. So, with all these available networks at arms reach, how do you decide which one suits your company? Well, we did the homework for you. This blog post will look at the considerations to know when buying tank monitoring and what it means when you hear the networks that support a tank monitoring solution. 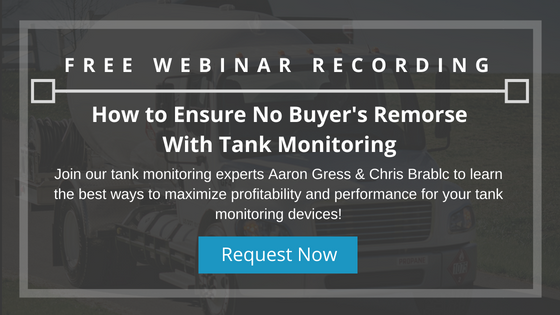 If you are investing in tank monitoring you need to know that the monitors you are buying will remain connected for years to come. For those who purchased 2G devices years ago, you know the pain of having devices that don’t work because a network is no longer supported by a provider. Coverage: Coverage is about the breadth and quality of connectivity provided. Finding a reliable network that reaches even your most remote customer tank locations can be difficult. Getting coverage you can rely on will prevent dreadful run-outs, provide accurate and real-time readings, and eventually save you loads of cash. Management: Networks should be simple to use out of the box and easy to manage. How easy or difficult is it to leverage the network initially, but also day to day and at scale? No one wants to use a complex network that requires constant supervision for each customer. Whether it’s deployment issues, unpredictable interferences, or costly maintenance, no small network issue should impede your business profitability. Cost: Consider value provided in coordination with the soft and hard costs. When it comes to costs, be mindful of not only the initial upfront cost, but also the dollar value of the maintenance required. Leading network costs can be expensive but almost always worth it compared to the costly resources required to manage an unreliable network. Faulty tank monitoring networks can ultimately make you pay the bigger price for your business. Below we put together the pros and cons of the common networks including Cellular, WiFi, Satellite and LoRa. Here is a simple chart to understand the Coverage, Management and Costs associated with each network type along with a longer description. Cellular networks have been around for quite some time now. However, the recurring cycle of replacement technology has recently made leading providers terminate their ancient 2G networks. Similarly, those with 3G devices should note the impending sunset predicted for somewhere within the next few years! As more advanced technology penetrates its way into our society, it is hard to find a lasting solution for your tank monitoring devices. Thankfully, we know the fix. 4G LTE is the latest and greatest cellular network on the market. It is your best bet for a dependable, easily managed and long-term tank monitoring solution. With data transfer speeds exceeding a whopping 100 mbps, it generates a greater capacity for more frequent tank readings, and maximizes tank monitor performance. Cellular data is almost universal by now. Leading providers are investing significant amounts of time and money in an arms race to provide the best and most reliable 4G LTE coverage. It is more difficult to find a location without cellular data. Providers like Verizon have 4G LTE coverage that covers 98% of our nation, and over 322 million people! Perhaps the biggest advantage to choosing cellular tank monitor devices is the ease of management. There are no costly towers that need to be installed, individual WiFi networks to maintain, or weather conditions to interfere with connections. Widespread cellular coverage ensures effortless and longstanding connectivity. 4G LTE is the leading form of network connectivity and you pay for the reliability it provides. However, these hard costs will ultimately make up for the time, labor and equipment needed to address each individual network issue. But hey, you get what you pay for! If you have internet in your home, chances are you are using a WiFi signal to connect online. WiFi is among one of the first fully-standardized high speed wireless technologies available in the broadband market with data speeds that can range up to hundreds of megabits/second. Its ease of maintenance, stable connectivity, broad deployment and low price can make it a good selection for remote areas and for consumer purchased devices. WiFi coverage ultimately depends on the location; research shows that 70% of Americans already have established WiFi access, therefore, this is an existing network that can be used for internet connected devices. Because WiFi requires a stable router, the range is somewhat limited but can reach up to a 300 foot fixed radius. WiFi can make sense in remote areas and where the propane tank is near the home. WiFi is inexpensive as the underlying network is almost always already in place. Locations that are seemingly in the middle of nowhere are not fully deprived of broadband networks. This traditional connection relays data from your monitor, to your service provider’s satellite, to the satellite received located elsewhere on the earth’s surface. It provides very wide coverage at the expense of its data speed and cost, averaging only 1.3 mbps it serves as a perfect last resort for reaching your customers located in very remote areas. Satellite networks have full coverage that transmits data over a very, very wide range. You can access connection virtually anywhere, but need line-of-sight visibility to the sky which can sometimes be disrupted by weather conditions. Satellite tank monitors are ideal for customers in remote regions where more efficient networks are inaccessible. Satellite powered devices are prone to interferences. Their weather dependency means connectivity may be lost if there is no clear and direct route to the satellite, perhaps on a cloudy day. Similarly, in times of high satellite demand and usage, it may exhaust the capacity of the satellite and tank readings will experience high latency. From a supplier standpoint, it will provide readings at a slower and less frequent pace. Satellite connection can be very costly. This connectivity type generally requires a high equipment cost, and high monthly service payment to your provider. You’ve probably never heard of Low Range Wide Area Networks (LoRaWAN), and there’s probably a reason for that. LoRaWAN is a radio transmitter requiring installation of radio towers that offer long-range, low-power wireless connection. This network signal was built to be more affordable for limited range communications. Coverage depends on location and provider. The country’s leading LoRa provider reported their latest network coverage at only 15% of the population (50 Million people) – very limited when compared to cellular networks. The LoRa radio towers already in existence cover only a extended range which significantly decreases in more dense areas like cities. It’s important to clarify the existing towers in the areas where you are putting monitors now and in the future when looking at a LoRa solution. While the equipment cost is typically low for the monitor itself, installation of the required network infrastructure can be costly, and installation waiting periods easily exceed multiple months if new towers need to be set up in your area. LoRa uses very little power though nearly every network supports battery life of 5 years anyway. However, this is at the expense of its latency; LoRa data speeds do not exceed more than 1mbps, which for reference is not even half as fast as the third generation cellular network (3G). What does this mean? Infrequent and less reliable tank measurements. Typically, LoRaWAN is the low cost alternative in terms of up-front and monthly service costs. However, significant maintenance costs eat into this depending on provider and whether new towers are required for your area. Because of its very limited coverage, more often than not one or more new towers needs to be installed before you can connect any monitors. Building a tower is expensive, and that cost is either built into the total solution or borne by you as the customer in addition to the traditional monthly fees. It also limits the scale of your tank monitor efforts should you want to expand your program. So which network should I choose? By now you should be more familiar with the network options available and how to evaluate which one is best for your business. In the end, it all comes down to the reliability of the network you’ll be able to use both today and 10 years from now. With literally hundreds of billions of investment in the 4G LTE cellular network, it’s hard to argue for a better mix of manageability and cost. Covering over 98% of the Nation, it’s coverage is widespread and reliable. Maintenance of the cellular network is nonexistent as cellular is available almost anywhere with high up-time. Best of all, 4G LTE is relatively new to the market and is a resilient network that will still be in use more than a decade from now, so your providers will be supporting it for a long time. Although there are cheaper networks available, it is in your best interest to choose one that is reflective of your business. So why not choose the latest and greatest? What is your recommended connectivity type, and why? What level of management should I expect to ensure my portfolio of devices are always up and running? With proper management, what % connectivity should I expect, typically? Can you walk me through how you support customers like me in a situation where a device isn’t connecting? Can I speak with a customer reference?